Governor Ron DeSantis today visited Tampa Bay Christian Academy where he held an educational roundtable and discussed his priorities for Florida’s education system. 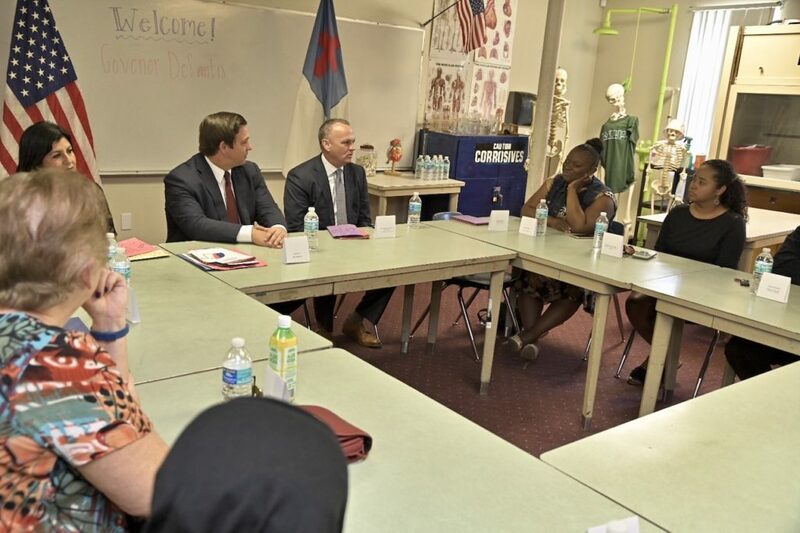 Joining Governor DeSantis in Tampa were Department of Education Commissioner Richard Corcoran, state and community leaders, as well as educators, parents and students of Tampa Bay Christian Academy. In January, Governor DeSantis signed Executive Order 19-31, to begin the process of making Florida the number one state in the nation for workforce education as well as ensuring that Florida students are prepared to fill the high-demand, high-wage jobs of today and the future. This will not only improve Florida’s education system, but will also bring increased investment and manufacturing jobs to the state. Governor DeSantis also recognizes the need to recruit and reward the best teachers throughout the state of Florida. That is why he proposed reforms to the Best and Brightest Teachers program, including new criteria so more educators are eligible as well as an investment of more than $400 million for compensation increases to the most effective teachers and principals in Florida’s public schools. The Governor has also prioritized school choice programs, including the creation of a new scholarship called the Equal Opportunity Scholarship that would provide parents with limited financial resources more options to better accommodate the educational needs of their child. Governor DeSantis has also proposed the development of a Bad Actor List to prevent charter school operators who have been sanctioned by the state from reopening a new school or program under a different name. Governor DeSantis understands that every student is different, with some learning better in environments that may be more suitable to their educational needs. To that end, he proposed an investment of nearly $19 million to fund the waitlist for Gardiner Scholarships, which would cover nearly 2,000 students with special needs and unique abilities.